Verify: Does menthol shaving cream heal sunburns? "The number one cure is prevention." GRAND RAPIDS, Mich. - After the hot weekend, you might be battling a bad sunburn. A viral Facebook post seems to offer a simple way to heal, and it might already be in your bathroom cabinet. 13 On Your Side Verified: Does menthol shaving cream heal sunburns? Cindie's Facebook post said applying menthol shaving cream on the burn “takes the heat out” and soothes skin. 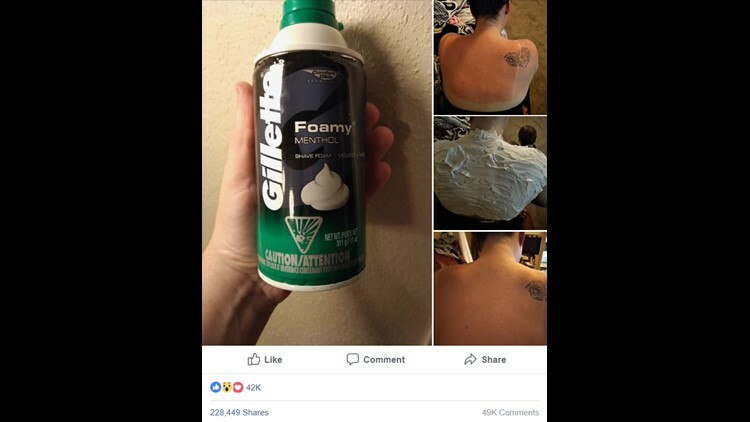 She posted before and after pictures of her sunburn, and she swears by her simple shaving cream solution. So we asked a doctor if he thought this is a fix. But, applying shaving cream to your sunburn could actually cause more harm than help. “There's a lot of ingredients that no one can pronounce or say, including myself, in shaving cream that could cause even more irritation when your skin is damaged by UV radiation, which is different than razor burn,” Reitzenstein said. We can Verify: Does menthol shaving cream offer a good solution to heal sunburns? “The simple answer is this isn't proven and I would never recommend it to my patients,” Reitzenstein said. But there are proven things you can do. Reitzenstein said although the before and after pictures are impressive, he has found no study testing effectiveness of shaving cream on sunburns. But he thinks a study would be worthwhile. The Skin Cancer Foundation recommends applying a water-resistant broad-spectrum sunscreen with an SPF of 30 or higher.